I was born in a small town named Lubar in the Zhitomir region in 1914. From 1935 to 1937 I served in the Red Army in Belaya Tzerkva in the 185th Turkestan Infantry. I completed the regimental school for junior commanders and received the rank of sergeant-major. After I was demobilised from the army, I moved to Kiev and started to work as a carpenter in the co-operative Kievkhudozhnik. When the war began I was called for military service again. We guarded military projects; at the beginning of August we were transferred to the village of Novy Petrovtsky where we dug in and set up to defend the area. One night we were alerted and directed towards the town. From the distance we noticed a column of motorcyclists, but we thought they were our soldiers. When we entered one of the houses we heard some shooting. We hurried outside and saw our soldiers shooting at the German motorcyclists, we ran towards our location but when we reached it, we saw that some of the soldiers had been killed and the rest had run away. We moved on but our soldiers kept on disappearing because of rumours that the Germans had announced that anyone who surrendered on his own will would not be punished, I understood that we had to reach our detachment in Darnytsa. In a courtyard I saw two women and asked them for some water to drink, they brought me some and asked where I was going in my uniform, since I would easily be noticed by the Germans. They invited me to sleep at their house and said that I could go in the morning. At dawn the hostess woke me up and told me to leave because the German soldiers were already there. If they found a soldier they would burn the house down, she brought a pair of old trousers and a jacket for me. She told me to change into those clothes. There was a school nearby where many people were hiding from the bombings, when I arrived at the school there were many people, mainly women, teenagers and children already in the building. There also were some young people in both civilian and military clothes with them. Very soon we heard some shooting, a column of German motorcyclists was driving by and one man in a militia uniform was throwing hand grenades at them. Afterwards the Fascists made everybody go into the street and started dividing us into different groups. I was placed into a group of young people, some who were still in uniform. 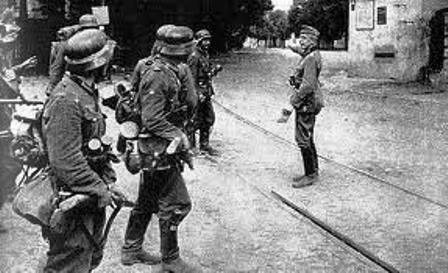 The order was given to shoot us, we were lined up and marched along the road, in the opposite direction another group of German soldiers led a column of military prisoners together with some civilians. Hearing that we were to be shot, the officer of that column added six people to our group, among them was one Jew in civilian clothes carrying a violin. When he found out that we were going to be shot he started begging fot mercy because he was a violinist. He took off his hat, threw it down and began to play his violin, until that moment I had been absolutely indifferent to the fact that we were going to be shot, but when that Jew began to play his violin, I felt something inside of me and tears began to stream down my cheeks. The Germans started to taunt him, one German cried out Yid, then they ripped of his pants to make sure he had been circumcised, another German suggested that they snip him again. They all roared with laughter, somebody pulled out a knife and cut the violinist. Even now I remember the wild screams of that man, they shot him and drove us further down the road. In the morning our group was taken to Kerosynnaya, as we were marching these people were throwing bread, tobacco, biscuits, sweets and whatever else they could to us, though the Germans did not allow anybody to come near the group. In Kerosynnaya the Germans had set up an immense camp for prisoners, here too people threw whatever they could over the fence, we were forced to work every day, at the camp. 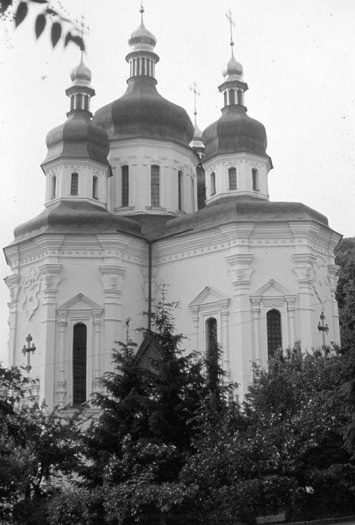 The usual work was to stand in a line and pass shells up the hill from the Vydubetsky monastery. They served us gruel in the camp, but there was nothing to pour it in, so people used their hats, caps or different tins for it. One day we were forced to line up and speaking through an interpreter, they ordered all the commanders and political commissars to step to the front. There were a lot of them and they were taken off somewhere. Then came an order for the Jews to come forward, I decided not to leave the line. Du bist Jude? – Are you a Jew? – the German asked me. Since I was afraid of being tortured, I admitted that I was, I was taken to the camp for Jews only. When I arrived I saw that all of the prisoners were lined up and a German ordered me to lie down. They started to beat me and the interpreter asked where the mines were located. At that time Kreshchatyk and other streets constantly were being blown up by mines that the Red Army had placed. Later we were lined up again and driven into a big garage, but there wasn’t room for all of us, they started to shove and press everybody inside, we were packed in like sardines. The gates were closed: we could not move an inch. We stayed like that for six days and nights, they did not give us food or water, many people died but there was no room for the corpses to fall, so they remained wedged between those left alive. The only thing we could hear were screams for water, the odour was unbearable, next to me was my cousin’s husband Shindelman, and some other fellows who I had met there. Everyone had a different opinion about our fate, some said that we would be let out, while others thought that the garage would be blown up together with us. At last the Germans opened the gates and ordered everybody over thirty-five to come out. Before an hour had passed they began to take everybody who stood near the gates, it happened several times, we heard only the cars roar and didn’t know the people were taken away. After those people had left there was enough space in the garage for those who remained. Through the holes in the sides we watched when the trucks came back and some clothes were unloaded from them. We realised then that all those who had been taken away were shot. Again the gates opened and they ordered everyone to come out. I went out we were ordered to take the corpses out of the garage. All the trucks were full and I got into a truck with corpses. Our truck started, then made a turn and braked. I jumped out of the truck, I don’t know how much time I was lying on the ground, they were shooting, when I regained consciousness I noticed that there were corpses not far from me, they had been shot on the side of the road. I got up and thought it would be good to get to the forest in Pushcha- Voditsa. I was somewhere in Loukyanovka, a district of Kiev, when I was noticed by a policeman. 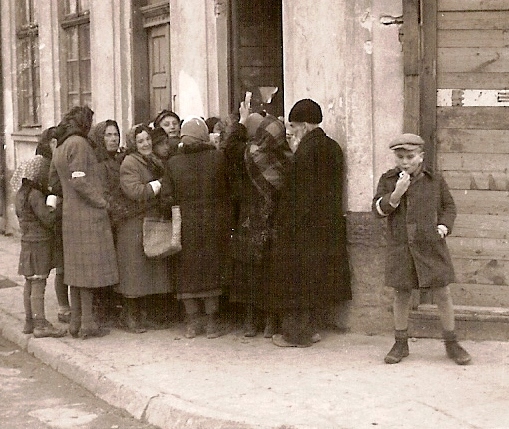 He brought me to 33 Korolenko Street and reported that I was a Jew. Nobody asked me anything but they made me clean the room with five other men until evening. That night we were locked in a cell in the basement. In the morning we were brought to the building of the Supreme Soviet, there we also did some cleaning and found some remains of food. The next morning we were brought to 3/5 Institutskaya Street, before the revolution it became the home of the Secret Police. The Germans first blew up the building, but then decided to partially repair it. After the mass shooting of Jews, they brought any Jew that was caught to that building to work on repairs. There were also some civilians who worked there, headed by the senior engineer Krynichny. They worked on heating and piping, in the evening they could go home and in the morning, they would come back to work.